Make art, not waste. That’s the thinking behind the two month artist residency at the new Concordia University Centre for Creative Reuse. Working alongside student exhibition space VAV Gallery, these organizations will have students envision art that’s not wasteful. Lenny Sharp, co-director of the VAV Gallery, said the goal of the residency is to get students to think about the shelf life of art and art materials, and to highlight the ways artists can work to eliminate waste in their practice. “There’s a lot of wasteful products that go into art materials, so we’re really trying to bring that around,” she said. Seven undergraduate Fine Arts students selected by the VAV Gallery and CUCCR have been chosen for the residency. From Jan. 9 until mid-March, the artists will create artwork made entirely out of reclaimed items and materials. The residency will culminate with a three week art exhibition in the gallery, from Mar. 19 to Apr. 6. The seven artists will be featured in the VAV Gallery’s program for the semester. 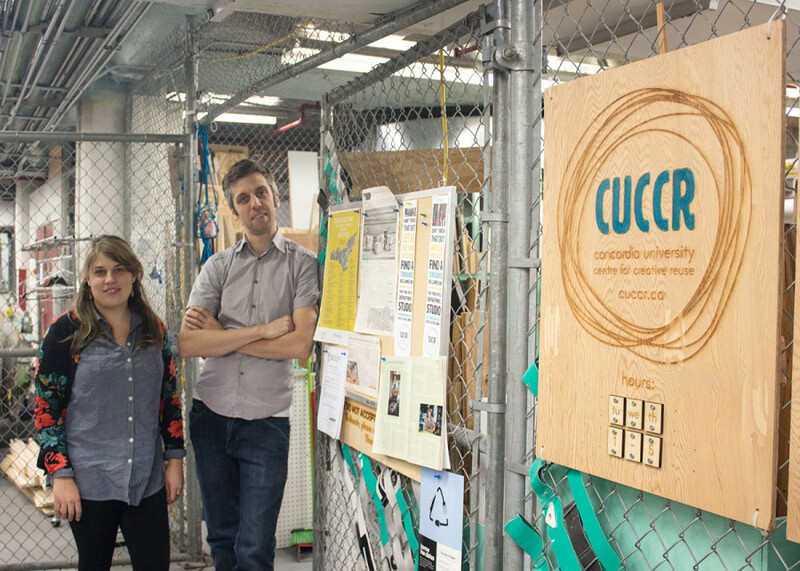 The art will mostly feature materials collected by CUCCR, an initiative that works to reduce Concordia’s waste by collecting reusable materials from the university’s waste-stream and offering them for free to students, staff, and outside community members. At the centre, you can find a variety of usable materials like wood, fabrics, sheet metal, and equipment like art supplies and hand tools. Arrien Weeks, depot coordinator at CUCCR, explained that there is a good mix of people who are in tune with with the concept of reuse in their own individual practice as well as those who were interested in exploring it in their own artwork. “We’re pretty excited to see what comes next in the coming semester,” Weeks said. The artists specialize in different art forms, so the finished works will reflect that variety of medium. “Some of the artists’ work might come out in a digital form or in a different kind of medium that won’t actually maintain the object, said Timm-Bottos. “There’s going to be different interactions with the material rather than [only] changing the material itself,” explained Weeks. Sharp said that the gallery came up with the idea for the artist residency partnership with CUCCR as a way to raise awareness about reuse in art, and to highlight the new initiative that currently operates out of the garage under the Hall building. “The Centre for Creative Reuse is a great resource and we’d also like to make it more well known to the Fine Arts students,” she said. The residency exhibition will also fall on CUCCR’s one year anniversary, on March 22. “We’re going to be celebrating our birthday in the gallery, showing off all of the work that was created during that residency, but also celebrating all of the hard work that’s gone into the creation of [the centre],” said Timm-Bottos. The VAV Gallery and CUCCR both hope that the residency can reoccur again in the future. “We’re hoping that maybe it turns into an annual thing because it is a really great resource. Both the VAV and CUCCR really strive to be there and [be] supportive for their students,” said Sharp.